Battery Type: Li-ion. Cell: 4 Cells. Otherwise, the unpaid case will be opened. Color: Silver. SVT15112CXS, SVT15115CXS, SVT151190X, SVT1511ACXS, SVT14112CXS, SVT14113CNS, SVT14113CV. SVT15115CXS, SVT15117CDS, SVT151190X, SVT1511ACXS, SVT1511M1E, SVT1511M1E/S, SVT151A11L. SVT141290X, SVT14129CC, SVT14129CCS, SVT141A11L, SVT141C11T, SVT15112CXS, SVT15113CDS. Sony SVF14215SC. Sony SVF15218SC. Sony Vaio 15E Series. Sony Vaio 14E Series. Sony SVF1521A2E. Sony SVF15217SC. Sony SVF15216SC. Sony SVF152A27T. SONY VAIO VPCEH16EC SONY VAIO VPCEL15EC. SONY VAIO VPCCA16EC SONY VAIO VPCCA17EC SONY VAIO VPCCA18EC SONY VAIO VPCCA26EC. SONY VAIO VPCCA27EC SONY VAIO VPCCA28EC SONY VAIO VPCCB17EC SONY VAIO VPCCB18EC. VAIO SVE141100C, VAIO SVE14111EG, VAIO SVE14111EGB. VAIO SVE14111EN, VAIO SVE14111ENB, VAIO SVE14112EA. VAIO SVE14112EAB, VAIO SVE14112EF, VAIO SVE14112EFB. VAIO SVE14112EG, VAIO SVE14112EGB, VAIO SVE14112EH. Capacity: 5300MAH. SONY VAIO EG Series. SONY VAIO CB Series. SONY VAIO CA Series. SONY VAIO EH Series. SONY VAIO EJ Series. SONY VAIO EL Series. SONY VAIO VPCCA Series(All 2011 modle). 1.ONLY SHIP TO USA. 2.TO SHIP TO USA ADDRESS VIA USPS WAY 3.A cells ensure fast charges and low power consumption; Built-in circuit protection ensures both safety and stability。 Item Description Battery Condition: Brand New,100% OEM Original Battery Type: Li-ion Voltage: 10.8V Capacity: 5000mAh Color: Black Warranty : 1 year Compatible Part: VGP-BPS22 VGP-BPS22A VGP-BPL22 VGP-BPS22/A Fit For: VAIO VPC-E1Z1E VAIO VPC-EA1 VAIO VPC-EA12EA/BI . SONY VAIO T14 Touchscreen Ultrabooks. SONY VAIO SVT-14 Touchscreen Ultrabooks. SONY VAIO SVT-15 Touchscreen Ultrabooks. SONY VAIO T Touchscreen Ultrabooks Series. SONY VAIO T15 Touchscreen Ultrabooks Series. Sony VAIO EH Series. Sony VAIO CA Series. Sony VAIO CB Series. Sony VAIO EG Series. Sony VAIO EJ Series. Sony VAIO EL Series. Sony VAIO VPCCA Series(All 2011 modle). Sony VAIO VPCCB Series(All 2011 modle). 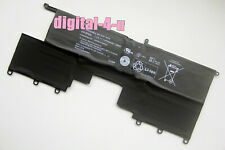 New Sony laptop battery 15V, 48Wh, 3170mAh. This battery is great for a replacement or if you just need an additional one. Compatible Part #'s: VGP-BPS40 Compatible Models: Sony VAIO SVF14N11CXB, SVF14N16CW, SVF14N26CW, SVF14NA1UL, SVF15N13CW, SVF15N17CX, SVF15N17CXB, SVF15N18PW, SVF15N18PXB, SVF15N23CGS, SVF15N27CGB, SVF15N28PXB, SVF15N2ACGP, VAIO Fit 14A, 15A, VAIO Flip SVF 14A, 15A. VPCSC Series. VAIO VPC-SB11FX/B, VAIO VPC-SB11FX/W, VAIO VPC-SB11FXB. VAIO VPC-SB11FXP, VAIO VPC-SB16FA/B, VAIO VPC-SB16FF/B. VAIO VPC-SB16FG, VAIO VPC-SB16FG/B, VAIO VPC-SB16FG/L. VAIO VPC-SB16FG/P, VAIO VPC-SB16FG/S, VAIO VPC-SB16FG/W. Smart surge short circuit protection. Battery Type: Li-ion. We stand behind our quality products. RELATED PRODUCT. Nearly all our products have UL, CE and RoHS certificates. Capacity ： 59WH. Sony SVE141C11T. Sony SVE141D11T. Sony SVE141L11T. Sony SVE141D12T. Sony SVE141C12T. 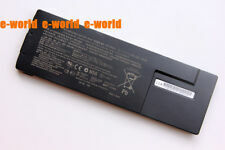 Compatible with Laptop Models Sony SVE14115YCP. No one is EVER ignored! ALL PRODUCTS ARE MARKED WITH SERIAL NUMBER AND QC BADGE. Battery is opened for pictures but never used - NEW. SVP11217PG, SVP11217SCS, SVP11229PGB, SVP1122YCG, SVP13213CGB, SVP13213CW, SVP13215PXS, SVP13216PG, SVP13218SCB, SVP1321BPXB, SVP1321C5E, SVP1321L1EBI, SVP1321M9EB, SVP1322F4E, SVP1322F4EB, SVP1322YCG, SVP132A1CL, SVP132A1CM, SVP132A1CV, SVP132A2CM, Pro 11, Pro 13. Smart surge short circuit protection. Battery Type: Li-ion. 100% New Components - never refurbished, recycles, or used. We stand behind our quality products. RELATED PRODUCT. Nearly all our products have UL, CE and RoHS certificates. SVT-11 Series. SVT-13 Series. Warranty: 12 months. SVT13128CYS SVT131290X VT1312BPXS. SVT13124CXS SVT13125CXS SVT13126CXS SVT13127CXS SVT13128CXS. SVT131190X SVT1311CGX/S SVT1311EFYS SVT13122CXS SVT13122CYS. Trending at $54.58eBay determines this price through a machine learned model of the product's sale prices within the last 90 days. Found better price?. (USA only) - write to us to negotiate a better deal! IMPORTANT INFORMATION. Smart surge short circuit protection. Battery Type: Li-ion. for Compaq. for Fujitsu. for Gateway. for IBM/Lenovo. for Panasonic. for Samsung. 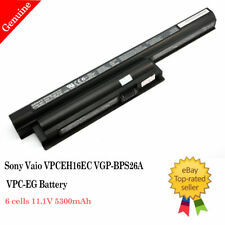 Sony VAIO Fit SVF15A18CXB 11.1V 3650mAh 41Wh Battery. Make Supersized Seem Small. No one is EVER ignored! ALL PRODUCTS ARE MARKED WITH SERIAL NUMBER AND QC BADGE. Battery Type: Li-ion. SVT-13 Series. SVT11127CC SVT11128CC SVT11137CC SVT11138CC. SVT13128CYS SVT131290X VT1312BPXS. SVT13124CXS SVT13125CXS SVT13126CXS SVT13127CXS SVT13128CXS. SVT131190X SVT1311CGX/S SVT1311EFYS SVT13122CXS SVT13122CYS. Trending at $55.88eBay determines this price through a machine learned model of the product's sale prices within the last 90 days. 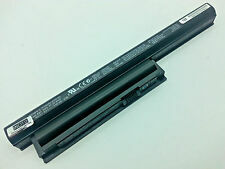 This is a replacement aftermarket battery made by NinjaBatt for a Sony Vaio VPCF1 laptop. It works like new. Only used a couple times. Capacity: 3760mAh / 43Wh. SONY VAIO T14 Series. SONY VAIO T14 Touchscreen Ultrabooks. SONY VAIO T15 Touchscreen Ultrabooks Series. SONY VAIO T15 Series. SONY VAIO SVT-14 Touchscreen Ultrabooks. Battery Type: Li-ion battery. Property: new genuine battery. 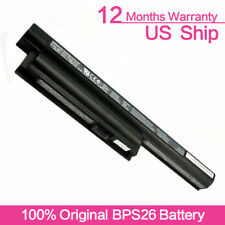 Battery Information Battery Capacity: 3760mAh (43Wh). Battery Color: Silver. We shall not be held responsible for the improper use of our product(s). Capacity: 6600mAh (better than 4400mAh). Smart surge short circuit protection. Battery Type: Li-ion. for Compaq. for Fujitsu. for Gateway. for IBM/Lenovo. for Panasonic. General Information. Compatible Part Numbers: VGP-BPL26. VAIO SVE14111EG,VAIO SVE14111EGB,VAIO SVE14111EN. VAIO SVE14111ENB,VAIO SVE14112EA,VAIO SVE14112EAB. VAIO SVE14112EF,VAIO SVE14112EFB,VAIO SVE14112EG. VAIO SVE14112EGB,VAIO SVE14112EH,VAIO SVE14112EHB.